New Year. New Projects. New Adventures! It's already February, 2018 is well underway, and so it's time to do an update as it was a very busy end to 2017. Rewinding back to last Summer, in July I took part in the Newark Book Festival with Lucy Rowland, the author of 'Pirate Pete and his Smelly Feet' and 'Jake Bakes a Monster Cake' published by Macmillan Children's Books. Lots of little pirates turned up to draw Pete and make pirate hats! Then in August I was asked to take part in a Pirate Pete book signing at a local indie shop, Bo Peep Boutique in Lincoln. I was also given part of their window to design a display to promote the book complete with palm trees, foliage, birds and of course the main guy himself! It was publication time for 'Jake Bakes a Monster Cake', the second book that I illustrated written by Lucy and published by Macmillan. This was a great book to work on and we managed to come up with a weird and wonderful bunch of characters for it. I was also asked to do another book signing and window display which was a lot of fun to do. Then it was onto a Bright Group International 'Storytime Sunday' event at my agency in London. To end September off I also had my Lincoln Knights Trail sculpture auctioned off for charity and it made a fantastic £4200. Carrying on the busy end to the year Spider! was published and it even made BBC Breakfast. I was kindly asked by my publisher Hachette to take part in the Cheltenham & Henley Literary Festivals alongside the fabulous Alison Steadman to promote our eight legged mini-beast. It was such a laugh being on stage with Alison and we had a great time entertaining the packed out audiences. After lots of talking and lots of books signing, we both had a well needed Gin! Everyone has a different story as to how they became an illustrator, some have known since they were very young that they wanted to do it and some have changed careers entirely. My agency approached me to write a blog piece for them about how my career as an Illustrator developed over the 14 years since I started. I was pretty honest about it all and I think I could have been even more candid but what I wrote will hopefully resonate with others. And so Christmas and New Year came and went and 2018 stretched its' arms and awoke. So what's in store? For starters I've been working on a lot of new development for a couple of publishers and although I'm not able to currently show anything I'll hopefully be able to share something soon. I've also formed a partnership with Cottages de Garrigue out in the Dordogne to sell some exclusive prints I designed for them. I've been visiting this French region since I was very young and it's such a lovely area. So lovely in fact that there could be some big changes on the horizon...more to come in the foreseeable future. Towards the end of the year 'Mrs Claus Takes the Reins' will be published by Amazon. It’s Christmas Eve morning, and Santa Claus is still in bed! He’s feeling stuffy and sneezy and slow as a yeti. Will Christmas have to be canceled? Find out later in the year! In-between that we're off to the Bologna Children's Book Fair again to keep the Swine Bars' coffers topped up. 'Yoga Frog' is published in April by Running Press which comes with it's own posable bendy character. I also have some projects in the pipeline too, so 2018 is sure to be busy! Plenty to tell (again) as it’s been a while since my last update but lots of exciting things have happened since then. So it's only been.....four months since my last post!! This year has been the busiest on record and I've been involved in all sorts of different things alongside my commissioned picture books from painting sculptures and animating trailers to designing book festival postcards and prints for charity. It's all been happening and I'm looking forward to a break away in France later this Summer. I'll be putting together a separate area on this website for everything Knights Trail related, from the initial design to work in progress shots, so I'll keep this brief for now. I'll post up images of the billboard when it's up on the building but it was the biggest piece of artwork I've had to do so far measuring 4m x 3m. If you are in the area be sure to check out the Knights Trail as there are some fantastic designs on show and plenty of good pubs along the way. This will be available later this year in all good bookshops and online from the 7th September. Then it was onto Spider! written by the fabulous Alison Steadman (Gavin & Stacey, Abigails Party, The Singing Detective) and publishing with Hodder Childrens. The story follows Rafael and his pet cat on a journey discovering about the common house spider and why they really aren't that scary. I've always been a fan of spiders and I think they get some bad press sometimes so it was great to work on a book that details how amazing these eight-legged mini-beasts really are. The book includes lots of facts and figures about spiders along the way so it makes for a fun educational book as well. It was great to work on this title with the Hodder team so looking forward to many more. This book will be out in all good bookshops and online in October. This took me by surprise I have to say as I've always held this award in high regard, so to be shortlisted out of the thousands of images sent in was a proud moment in my career as an Illustrator. The World Illustration Awards is judged by industry professionals and it always showcases an array of different work so to be included amongst the incredible talent that was shortlisted was fantastic. You can read a blog that my agency wrote about it here. I'm looking to take this image further as I feel there's more to say so watch this space! 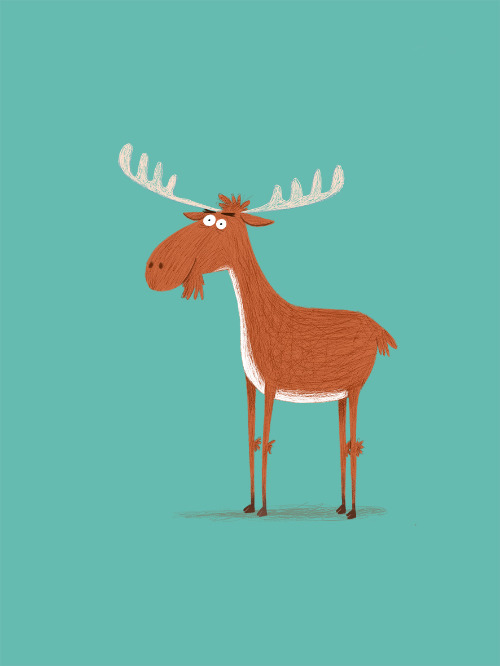 With the publication of 'Too Many Moose' around the corner I thought I'd put a little making of together for this book. So here's how this book written by the fab Lisa M. Bakos came together. From the outset the book needed to start calmly and then descend into a lot of moosey chaos. I wanted to keep the illustration style bright, colourful and quite minimal in areas as the whole focus was on Martha and her ten moose. So the use of white space in the book was important and how I could keep the pages interesting but not overload them at the same time. Some early cover ideas. I had the thought of using letters and envelopes as a border to frame the two main characters. This set of cover ideas were moving in the direction the publisher wanted however and we decided to go with number two. Going to art with the chosen design, everyone felt the moose looked a bit unhappy at being wrapped up in a load of parcel tape (wouldn't you be too?) also Martha needed to look happier and more animated to express her joy at receiving her first moose. I also went to colour on one other idea I had, to see what it would look like and to give the publisher a choice just in case. While this looked alright it was felt that we needed to see the whole moose and not just his head stuck through a letterbox. The type that I created was working well though so we used this in the subsequent rounds of cover designs as well as the stamp concept. So it moved onto Martha literally falling off her feet with excitement and our moose bursting out of a box. The colours used here were perceived as a bit 'Christmassy' and as it's a Summer publication they needed to change. The slightly washed out moose in the background were to change as well as the cover wasn't leaping out enough. The box has been changed as well as a stripy yellow background added. It's much more of an inviting cover now however the type couldn't be read from a distance very easily so this was also refined. …and this is the final final, final cover after lots of tweaking. The title changed towards the end of the project too after the publisher addressed a slight issue. A spread full of maple tea, movies and makeovers. In May Illustrators, authors and children responded to a publication of Nicola Davies's poem The Day The War Came which drew attention to the 3000 unaccompanied Syrian children that the UK government decided not to give a safe place to stay. Nicola called on everyone who was outraged by this to paint, draw or sketch an empty chair and then share it on Twitter. In the meantime I was kindly interviewed by Gabriela Gonzalez, an illustrator living and working and Belgium and who is the Regional Illustrator Coordinator for the Society of Children's Book Writers & Illustrators, Belgium. 2016 is off and running and January has already flown by. I'm also very late getting round to updating everything on here so apologies for that. However it's been a very busy start to the new year! So what's been going on since my last news update way back forever ago in August last year. The Bright Group Christmas party was fun as always being held at the new Bright Emporium which is a fantastic new gallery space that also hosts book readings and other events. Now in my thirteenth year represented by Bright this new premises will open up a whole new dimension to the agency and I'm very proud to be a part of it. Over the Christmas and New Year period I also moved out of my old studio and into my new one at home. There were many factors that contributed to moving out after being there for seven years but sometimes you need a fresh look and a change. After all….…change is good! It's certainly worked out very well for me as I'm really happy with how the new studio has come together, even turning my hand to carpet fitting in the process. But the end result has produced a very creative, inspiring space to work in. I've filled it with all my books and prints that I've acquired over the years, it's also energised me into picking up my paints and pencils again. Sadly I downed these tools for far too many years and decided to sit in front of a tablet. Digital artwork is fantastic and the majority of my work is produced using lots of different custom-made brushes and textures in Photoshop, however it's been great to pick up a brush again and 'retrain' myself using traditional media. Currently working up some pieces in the style below as they've been well received so I'm very pleased with how it's going! Work-wise I don't think I've been busier. Around some of the smaller projects I've got on I'm currently writing and drawing up the concepts for the next two 'Brian the Smelly Bear' books with Hinkler in Australia, one involves a love interest for old Brian and the other…..well you'll have to find out but things get a little bit crazy for him let's just say that. Also my work with Macmillan is moving forward at a rate of knots. Revised roughs are being drawn up and the cover has just been approved for 'Pirate Pete and his Smelly Feet' so it can go into the Rights Guide. Sneak peek coming soon! As well as all this I was asked by Cygnet Ink to come up with an image of our fantastic cathedral here in the city of Lincoln. It's currently for sale in the cathedral shop and will be online here very soon! I chose to do the iconic West Front which is the main entrance of this incredible building. I wanted to keep to a very simple design and a limited colour palette while giving it a contemporary feel. So all in all it's a busy time in the new studio. Bologna Children's Book Fair is just around the corner which I'll be visiting again this year, we've managed to get a fantastic place in the middle of the city with a roof terrace so drinks round ours. Looking forward to catching up with friends and publishers out there and generally having a few days away from the studio. I'll be sorting my personal shop on here out at some point as well where you'll be able to buy limited edition prints. So two months have passed since my last update (sorry!) but I have been very busy with various things and time has flown by! So what's been going on since May? It's been moose, moose, moose for a while and we're now at the artwork stage for Mail Order Moose which is great news. It's been a lot of fun to do and it's really coming together. The cover artwork has been approved and we're just tinkering with the type so it stands out on the shelf and it'll be good to go. There's been a few versions of the front cover and I'll post up some cover developments for this very soon. I've just signed a very exciting two book deal with a fantastic publisher and I'll be posting this very smelly news soon. To round everything off I went to the very impressive RIBA (Royal Institute of British Architects) building on Great Portland street for the Macmillan Summer party. Saw some familiar faces and met some new ones, all in all a lovely evening, many thanks to Macmillan and my editor Laura Roberts for the invite. I recently had to do some samples for a pitch out in the US on a book called Mail Order Moose. It was great fun drawing this guy and seeing how he'd work. The story contains so many moose/mooses/meese that I'll be able to draw them with my eyes closed by the end of it. A fantastic natural phenomenon occurred the other day and I thought I'd doodle a quick illustration to mark it. Solar eclipses happen from time to time and to experience one is an incredible feeling. Twilight at 0930 as you're having your breakfast is very strange and where I live in the UK about 90% of the sun was blocked out. Roll on 2026 when we see the next one! For now it's right back to work and it's a very busy start to the new year for me. I'm carrying on with the nine book series I have with Simon & Schuster and Sainsbury's, we're now on book four with book one to three published very soon. I've just started a new book series with Simon & Schuster US about a pair of kids that get up to all sorts of adventures in New York so I'm designing the cover jacket for that at the moment. 'My Hamster is a Genius' written by the fab Dave Lowe is up for the Worcestershire Awesomest Book Award with the winner announced in March, so fingers crossed for Stinky & Jinks! I've also been sent a nice little project with Ladybird, there's new work to do for the upcoming Bologna Book Fair and also my first author/illustrated book that I'm currently writing. So it's pretty much all go!! 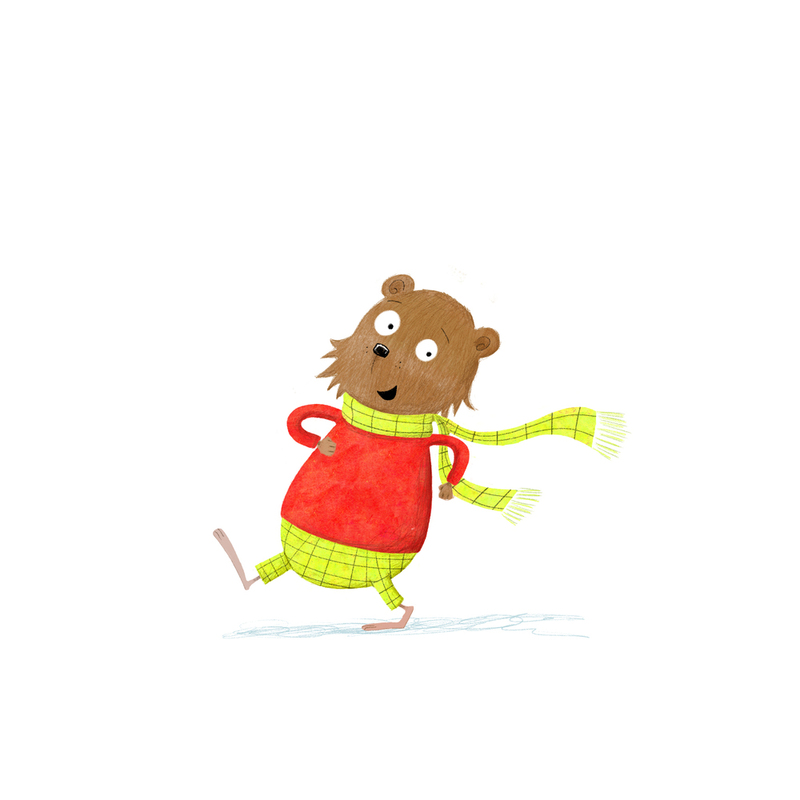 A new picture book by Charise Harper that I did the scribbles for is coming out this Winter. Perfect for little girls, it even has a magic wand in it!! Below are some development sketches for this book and shows how the main character of the book came together…. My agency Bright Group International have just finished putting the final touches to a fantastic new literary site. Here's a snapshot of the 'Rising Stars' page which I'm very proud to be a part of alongside some great people and superb scribblers! So on Monday I had a fab email from Templar saying that one of the Stinky & Jinks books that I did is up for another award. This time it's 'My Hamster's Got talent' for the 'Worcestershire Awesomest Book Awards' and it couldn't be more awesomest news. Roll on 2015 and stay tuned to see how the little guy gets on!